When properly maintained, hardwood floors can last a lifetime, even in a kitchen! Although some argue that tiles, slate or marble are more effective flooring options for the hardest working room in the house, wood brings a natural warmth unequaled by other materials. Liquids are the enemy. Water and steam can dull the finish and irreparably damage the wood. Instead, use the damp mopping method. Dip the mop into a bucket and wring it out until it’s almost dry. Next, go over the floor twice, once to dissolve the dirt and the second pass to remove it. Make sure no water has been left standing on the surface and finish by using a towel to buff the floor dry. As lot of cleaning solutions on the market are not only expensive but also emit harmful toxins, always opt for natural cleaners instead. Simply using warm water and basic dish soap will take your floors from dull and grimy to gleaming and gorgeous! Then tackle scuff marks and small stains by sprinkling baking soda onto the affected area and scrubbing with a sponge. Don’t Forget These Easy Preventative Tips! Position mats inside and outside your kitchen doors to reduce the amount of dirt that gets tracked into the house. Vacuum your wood flooring on either a weekly or bi-weekly basis, using the floor-brush attachment. 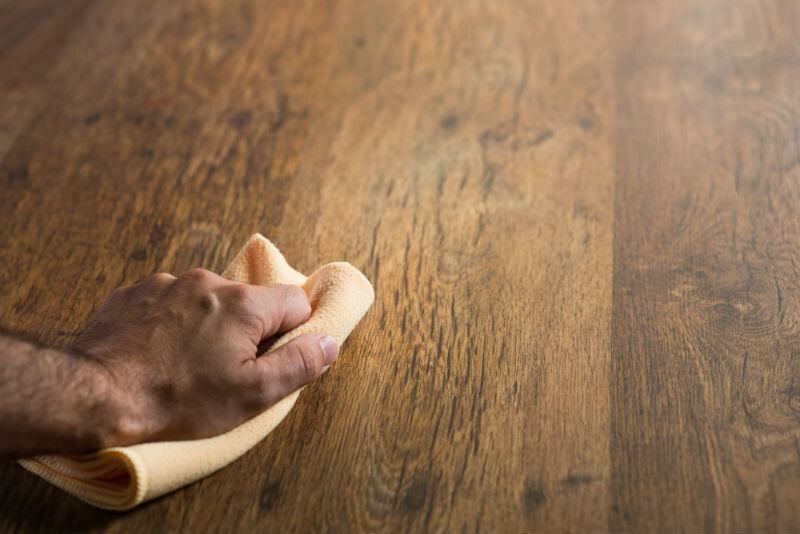 Harsh chemicals, steel wool and sandpaper should be strictly avoided as they can lead to permanent damage of the hardwood floor finish. Bonus Tip: Solid or Engineered? As the name suggests, solid wood flooring is made from planks of wood and nothing else. Engineered flooring on the other hand, is made from layers of plywood that have been bonded together to form a strong core board, finished with a top-layer lamella. However, the biggest difference lies in how the two react to changes in heat and humidity. Engineered wood flooring doesn’t expand and contract to the same extent as solid wood flooring. This means it’ll withstand pretty much whatever your busy kitchen throws at it!